When a few months ago the new Serbian President Tomislav Nikolic paid his first official visit to Brussels, EU High Representative for Foreign Affairs and Security Policy Catherine Ashton needed some help to recognise her guest among the other members of the delegation before their official meeting. 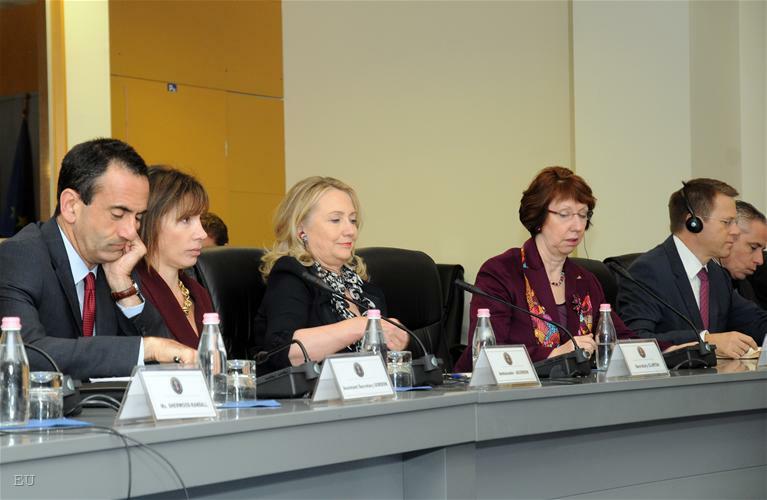 This moment was recalled in Belgrade last week, when Ashton, accompanied by US Secretary of State Hillary Clinton, visited the Serbian capital as part of their joint Balkan trip. "The Secretary travelled to the Balkans to demonstrate the enduring US interest, commitment and support for its future in the European and Euro-Atlantic community", the State Department official statement about the trip read. 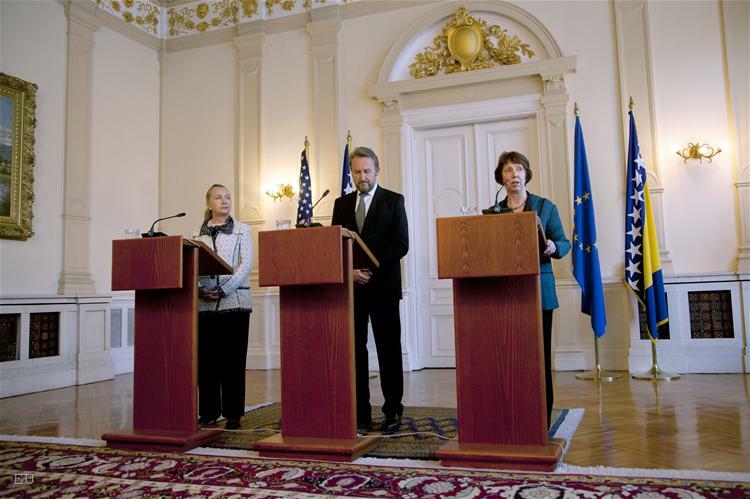 Clinton's and Ashton’s visit came just a few weeks after the European Commission’s latest report on the progress of the Western Balkan countries in their EU accession and just a few days before the presidential elections in the US. It started from Sarajevo and was described by some analysts as "motherly care for Bosnia" (as independent Sarajevo-based analyst Esad Bajtal wrote in a commentary for Al Jazeera Balkans). "The two ladies came with a clear message of support for Bosnia’s EU integration and that this perspective is important, while the constitutional reforms are inevitable", Bajtal says. 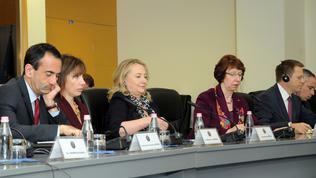 Clinton underlined that it was unexplainable how 17 years after the war the nationalistic rhetoric and of disintegration was still used and that she supported multinational Bosnia, and also that with their common visit "the US and EU show their common position that undoubtedly Bosnia belonged to the EU". And if the Ashton’s visit could be linked with the Commission October report in which Bosnia is described as a laggard behind all the other Western Balkan states, the goal of the Clinton’s visit, according to some analysts, could be explained by the fact that she planned to leave her post even if US President Barack Obama won a second term in office. "The bulk of US voters do not have a clue where Bosnia is, and that Obama’s administration is even dealing with this issue. On the other side, however, the link should be sought in the protocol meaning which is in the fact that the Secretary of State was trying to resolve unsettled issues (before the end of her term)", foreign policy analyst Mufid Memija writes also for Al Jazeera Balkans. 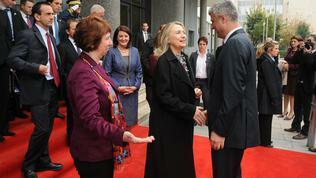 Maybe this is one way to explain the fact that the Clinton and Ashton trip did not include Podgorica and Skopje. Apparently, Montenegro is the leader in the region on the path toward EU and NATO, but the decision to skip Macedonia, which was not included in Clinton’s previous trip to the region in January 2011 too, was negatively interpreted not only in the Western Balkans. 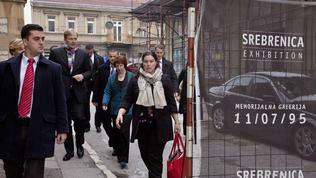 Expectedly, the most important stops were in Belgrade and Pristina. 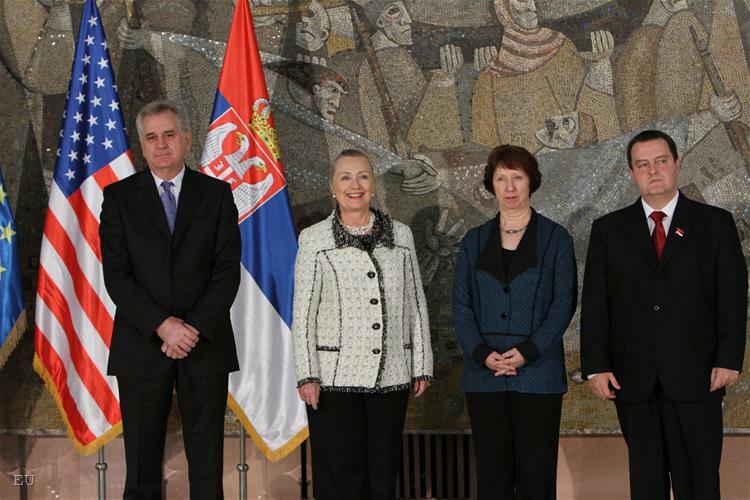 "I’m here today with Secretary of State Hillary Clinton to express our joint commitment towards Serbia and its future in the European Union", Ashton said following a meeting with Serbian President Tomislav Nikolić and the country’s Prime Minister Ivica Dačić. However, it is more than clear to everyone that this commitment cannot be achieved before the Kosovo issue is resolved, which was confirmed by Ashton’s statement: "But let me stress: the dialogue with Pristina and the normalisation of relations, as we call it, which is not asking for recognition, is really important. 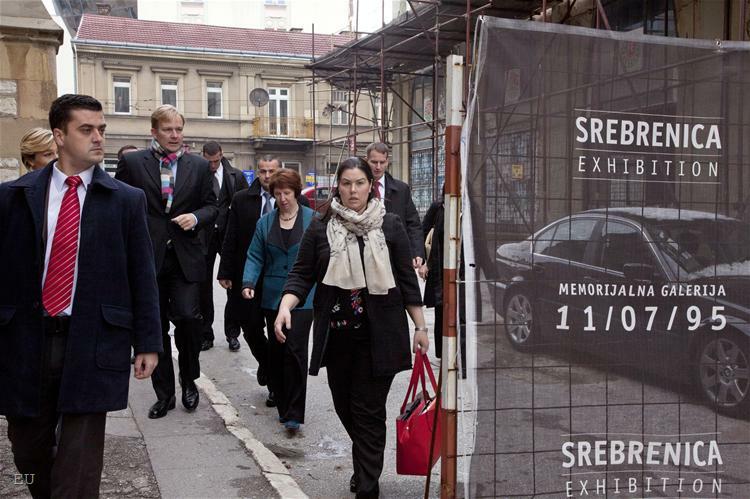 [...] This is good for Serbia, and it’s good for Kosovo. It’s good for your future and for the everyday lives of the people in this region". 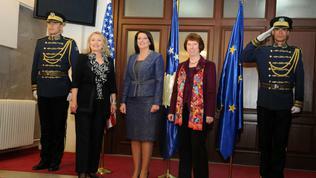 President Nikolić's response was: "We have a ready-to-go resolution for Kosovo". In an interview for the state-run RTS TV broadcaster, he said that there was a high degree of agreement on the platform for Kosovo and that the document could soon be endorsed by the Serbian parliament. 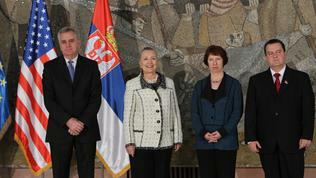 What was said in Belgrade, was reiterated in Pristina: "[To achieve this] political will, even courage, is needed, but if they manage to achieve progress, both Kosovo and Serbia will receive the help needed to resolve other issues such as strengthening the economy and opening new opportunities",Clinton said after meeting with Pristina top officials. She explained that a border redesign or renewed opening of the Kosovo independence issue were out of question and reiterated that for "her, her family and all US citizens, that was more than a foreign policy issue, but a personal one". According to some analysts in Pristina, however, the aim of the Clinton and Ashton trip was to exert pressure so that Kosovo’s northern part did not receive a special status. They even warned that normalising relations between Belgrade and Pristina would be meaningless if in the end Kosovo was not recognised by all EU member states and was not accepted in the UN. 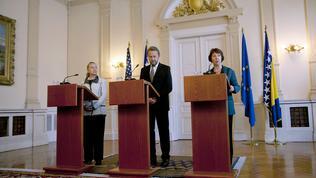 The dialogue between the two parties continued on Wednesday (November 7), when the prime ministers Dačić and Thaçi met separately with Ashton in Brussels and then the three of them met together. A day earlier, following a meeting with his Croatian counterpart Zoran Milanović, Thaçi commented on the plan, which is being prepared by Serbian President Tomislav Nikolic to resolve the Kosovo issue, that Serbia had neither the moral, nor the legal right to resolve this issue and that any plan should be a European one. Mentioning Zagreb - the city was one of the stops in the Ashton and Clinton trip too, but as there are no unresolved issues, because the country is a NATO member and in a few months will be a full EU member, it was described as a stability factor in the region. The visit in Tirana, which is last in the queue of the EU integration process, was used to urge Albanians to overcome their political struggles, which are the main hurdle on the country’s EU accession path. Hasim Taci, is that the guy who two years ago was accused that he masterminded killing of more than 1000 Serbs for their organs? Than miraculously all the news stopped reporting about it because he agreed to do what he is told.Now he needs to be told what else he needs to do. I bet the meeting was great. Was it that Albanians will get Macedonia? That is exactly what the EU need yet another country run by US sponsored drug lords. Let me just remind everyone that Kosovo was independent in the times of Third Reich too but that came to an end and so will this!!! !